The external environment facing Asia-Pacific economies is becoming more difficult, but is unlikely as yet to have a significant impact on sovereign credit profiles, says Fitch Ratings. Rising US interest rates and increasing global risk aversion towards emerging market assets are generating capital outflows and exerting downward pressure on most Asian currencies, particularly the Indonesian rupiah and Indian rupee. Trade tensions between the US and China have added to market jitters and pose downside risks to growth. Nevertheless, strong fiscal and external buffers, along with flexible policy frameworks, should allow most of the region’s economies to weather these challenges. Almost all sovereign credits in APAC are on a stable outlook after recent upgrades in Vietnam and Mongolia. The exception is Pakistan, where the newly elected Government is under immediate pressure to arrest deteriorating external finances and address fiscal challenges, as well as to attract the external funding necessary to meet its financing gap. A new Government has also taken office in Malaysia and moved ahead on many of its key election promises, notably repealing the GST. However, the new leadership has also shown signs of adhering to fiscal deficit reduction and improving governance, and we recently affirmed Malaysia’s rating with a stable outlook. Recent sell-offs in Indian and Indonesian currency markets underline their sensitivity to shifts in global sentiment, and suggest further bouts of pressure are likely as global monetary tightening progresses. Currency volatility, however, is likely to have only a limited impact on their sovereign profiles. India’s sovereign credit profile, for example, benefits from relatively strong external finances, especially a low level of external and foreign currency debt. Moreover, the risk of currency pressures triggering a policy-induced spike in domestic borrowing costs is mitigated by the Reserve Bank of India’s relatively narrow focus on its inflation objective. Bank Indonesia has shown a greater focus on currency stability and has been more active in counteracting external pressures. It has raised interest rates by 125bp since May, and has intervened aggressively in the foreign exchange market. That said, its external finances are stronger than during the 2013 taper tantrum due to a disciplined monetary policy stance and macro-prudential measures that have helped curb a sharp rise in external corporate borrowing and encouraged stronger hedging practices. Indonesia also has healthy fiscal buffers. 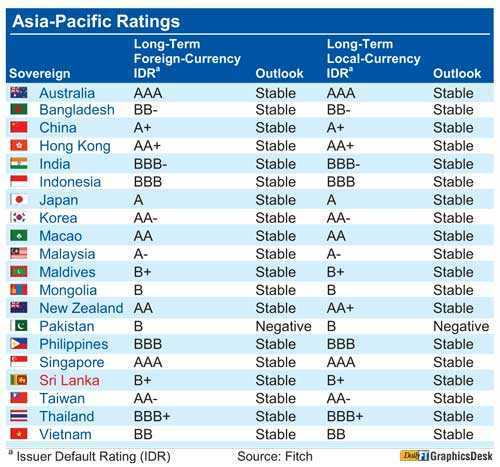 We affirmed Indonesia’s sovereign rating at ‘BBB’/Stable yesterday. Growth momentum is moderating in the region’s two largest economies of China and Japan, but is so far in line with our expectations. In China, the policy stance has shifted towards easing, a departure from the previous singular focus on containing financial risks. It appears, so far, that policy easing will fall short of a full-scale credit stimulus, which the authorities appear eager to avoid. Additional easing over time could put downward pressure on China’s ‘A+’/Stable sovereign rating if it contributes to rising imbalances. More broadly, economic activity across the APAC region held up through the first half of 2018 on strong domestic demand and robust exports. Fiscal policies are supporting increases in infrastructure spending, and monetary conditions remain accommodative, even after recent tightening in some economies. We would expect any escalation in trade wars that includes the US’s proposed tariffs on $ 200 billion of China’s exports to have a meaningful impact on the region’s economies. Singapore, Korea and Taiwan – trade-dependent economies with close supply chain linkages with China – would be hit hardest, but some other economies might benefit from lower oil prices and a shift in manufacturing away from China.